DATE OF PUBLICATION OF THE OFFICIAL VALID STANDARD : 26.05.1982. CLASSIFICATION F.C.I. : Group 2 Pinscher and Schnauzer- Molossoid breeds – Swiss Mountain and Cattle Dogs. Guard and defense. 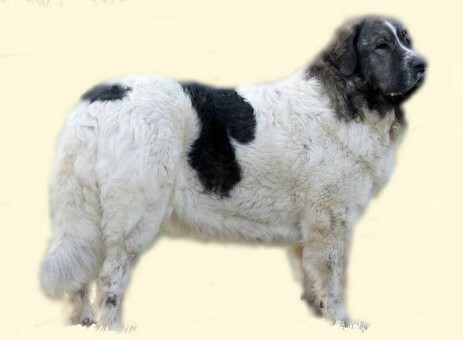 Previously, the Pyrenean Mastiff was used for defense against beasts of prey, in particular against wolf and bear. Nowadays he is an excellent guard for country estates and their owners as he is easily trained. That of a very large dog, above average size and of medium proportions. Harmonious, emphatically strong and muscular. Firm bone structure. Coat not exaggerated in length. In spite of his size, must not give the impression of being heavy or sluggish. Well balanced and harmonious over. The length of the body measures barely more than the height at withers. Length of skull in relation to bridge of nose = 5 : 4. Breadth of skull : Equal to or slightly larger than length. Relationship of height at withers to girth of chest is approximately 7 : 10. Friendly towards humans, calm, noble and very intelligent, at the same time courageous and proud towards strangers from whom he never backs away. In his behaviour towards other dogs, he is good natured and aware of his superior strength. Occasionally, he will fight with great skill, an atavistic quality which goes back to hundreds of years of fighting wolves. His dark bark comes from deep within his chest. His expression is alert. Large, strong, moderately long. Length of skull is 5 : 4 in proportion to bridge of nose. Longitudinal axes of skull and muzzle are very slightly diverging to almost parallel. Seen from above, skull and muzzle must be long and even in shape without marked difference between width at set-on of muzzle and width at temple. Seen from side, head must be deep and not bulging. Skull: Broad, strong, slightly convex in profile. Width of skull equal to or slightly broader than length. Occipital bone pronounced. Stop: Gentle, barely emphasized, but still visible. Nose leather: Black, moist, large and broad. Muzzle: Seen from side, bridge of nose must be straight. Seen from above, the muzzle is slightly triangular, tapering very gradually from its set on to the nose leather, without, however, getting pointed. Lips: The upper lip should cover the lower without any hint of slackness. The lower lip forms a marked labial corner. Mucous membranes should be black. Jaws/Teeth: Scissor bite. Teeth white, strong and healthy. Canines large, long, pointed, well adapted to each other, so as to be able to catch any prey. Molars : large and strong. Incisors: rather small. All premolars should be present. Gums black with pronounced transverse membraneous ridges. Eyes: Small, almond shaped, hazel colour. Dark eyes preferred. Expression is alert, noble, sympathetic and intelligent, but can be extraordinarily stern towards an opponent. Eye lids: black pigmented. When dog is alert, lids fitting close to eyeball are preferred. In repose, a slight slackness of the lower lid, which shows a small stripe of conjunctiva, is typical of the breed. Ears: Medium size, triangular, hanging flat. Set on above line of eyes. In repose, hanging close to cheeks. When dog is alert, clearly standing away from cheeks. One third of the upper and rear part should be slightly pricked. Ears should not be cropped. Should be the shape of a blunt cone, broad, strong, muscular and flexible. Skin thick and slightly loose. Distinct double dewlap, well formed, yet not exaggerated. General impression: Rectangular, powerful and robust, giving the impression of great strength, yet supple and agile. Upperline : Straight, horizontal standing and moving. Loins: Long, broad and strong, gradually getting narrower towards the flanks. Croup: Wide and strong. Compared to the horizontal its inclination is 45°. Height at rump equal to height at withers. Chest: Broad, deep, muscular and powerful. Point of sternum protruding. Ribs spaced widely apart with rounded ribcage, not flat. Proportion of height at withers to girth of chest: approximately 7 : 10. Belly and flanks: Belly moderately tucked up. Groin deep, flanks very broad. Set on medium high. Thick at root, strong and flexible. The coat on tail is definitely long, soft and forms a beautiful plume. In repose it hangs low and reaches easily to the hocks. The last third is always lightly curved. In movement and when the dog is alert, it is carried in sabre form with definite hook at tip but without the entire length being bent or resting over the back. General appearance: Seen from the front, absolutely vertical, straight and parallel. Muscles and sinews clearly visible. Length of forearm three times length of pastern. Good strength of bone, strong pastern. Shoulders: Well muscled. Shoulderblade sloping, longer than forearm. Angle of shoulderblade to upper arm approximately 100°. Elbows: Very bony, close fitting to ribcage. Angle of upper arm to forearm approximately 125°. Forearm: Bone sturdy, straight and strong. Pastern: Seen from side, slightly sloping, practically in continuation of forearm. Front feet: Cat feet. Toes tight with strong, well arched toe bones. Nails and pads strong and robust. Skin between toes moderately developed, hairy. General appearance: Powerful, muscular. Adequate angulations, seen from the side. Seen from rear and side, limbs are vertical. Hocks straight and vertical. Hindquarters must have the ability to provide with ease forceful drive with elegance. Upper thigh: Strong and muscular. Hip joint angle approximately 100 degrees. Stifle: Angulation from upper upper to lower thigh approximately 120°. Lower thigh: Long, well muscled and good strength of bone. Hock: Angle open, approximately 130 degrees. Hind feet: Cat feet of light oval shape, slightly longer than front feet. Preferred movement is the trot which should be harmonious, strong and elegant. No tendency for legs to swing outward. No pacing. SKIN: Elastic, thick, pink in colour, with dark pigmented patches. All mucous membranes should be black. HAIR: Dense, thick and of moderate length. The ideal medium length, measured on middle section of topline, should be 6 to 9 cm. The coat is longer on the shoulders, neck, under belly, at the back of legs as well as on the tail. On the plume, the texture is not as bristly as elsewhere on the body. The coat should bristly, not woolly in texture. Basic colour white, always with a well defined mask. Sometimes there are irregularly distributed distinctly outlined patches of the same colour as the mask. Tricolour or pure white dogs are undesirable. Ears always spotted. Tip of tail and lower parts of legs are always white. Mask should be clearly defined. It is an advantage if the outline of the patches is clear cut. At the roots, the coat should be as light as possible, ideally really white. The most desired colours are, in order of preference, pure white (snow-white), patches medium grey, intensive golden yellow, brown, black, greysilver, light beige, sandy or marbled. Undesirable are red patches and yellowish-white basic colour. There is no upper height limit. When quality is equal, the bigger dog is always preferred. Bridge of nose slightly arched when seen from side. Pincer bite. Any missing premolar. Topline not straight. Wavy, rolling movement at walking pace but not in an exaggerated way. Coat slightly wavy; coat in the middle section of the topline a little longer than 9 cm. Muzzle too pointed or too blunt. Absence of several premolars and canines if loss is not caused by an accident. Slight faults in the occlusion of the incisors. Height much greater at the croup than at the withers. Tail carried lying over the croup; lack of plume; lack of hook on the end of the tail; docked tail. General weakness in pastern, rear pasterns and feet. Cowhocked, either standing or moving. Legs swinging out sideways in movement. Coat very wavy or curly; coat in middle section of the topline slightly shorter than 6 cm and longer than 11 cm. Lack of patches on ears. Lack of pigment in noseleather or mucous membranes. Very marked overshot mouth, undershot mouth. Coat in middle section of the topline only 4 cm or shorter or longer than 13 cm. Absence of white colour; absence of white on the tip of the tail and on lower parts of the legs. Solid white coat colour : lack of mask. Patches not clearly defined and with little contrast to basic colour which points to a cross with another breed.